Today is the day we officially celebrate wildlife around the world. Even though March 3rd is officially set aside as World Wildlife Day, I encourage any readers to seek out nature and wildlife any day of the year. Spending time in and with the wild is a constant reminder to me that we need to conserve our wilderness and protect our wildlife. Below, I’ve shared five wildlife experiences that I hope inspire you to spend some time outside. I took this photo of the fox shortly after it had chased a wolverine out of its territory. I know it sounds like I’ve got it backwards, but this is one impressive fox! During that summer, he and his mate raised 5 beautiful fox kits. Daring Lake, NWT. If you’re looking for a wildlife experience but don’t have great access to the wilderness, don’t forget nature in the city. I love participating in citizen science initiatives, such as eBird and eButterfly, and many of my observations, like this American Snout Butterfly, come from in-city parks. Spartanburg, SC. Having grown up inland, I have very little ocean experience. I was thrilled this past summer, when I spent some time in a tidal flat and saw so many interesting creatures. This particular fish is a flounder.As flounders age, they transition from swimming upright to swimming in a flat position, like it’s being held in the above photo. During this this transition, the eye that is now on the bottom of their body migrates to the top of the face with the other eye! Charlottetown, PEI. I don’t really need more excuses to go out birding, but I’ll take them as they come regardless. Last weekend, from Feb 12 to 15, was the Great Backyard Bird Count (GBBC), a worldwide citizen science project that tries to capture an ‘annual snapshot of the distribution and abundance of birds’. Contrary to it’s name, the GBBC does not require one to bird in a backyard (great news for us apartment dwellers). I focused my efforts on Wellington county, my new home turf, and was able to find some new birding spots. For the second GBBC in a row the temperature was frigid, but that didn’t keep the birds at bay. Over the course of the count, I found 28 species including some highlights; Snow Buntings, Purple Finches, and a Merlin! Some odd looking birds. Need better plumage to stay warm. This past weekend I went to Algonquin Provincial Park with some good friends. It was both my first time at Algonquin and my first time seeing a few of the boreal birds we came across. Though it took me awhile to get to Algonquin the first time, I don’t think it will be long before I’m back. It is a beautiful park! 2015 was another great year. Highlights included moving from Ottawa to Fredericton, then to Kitchener, and then to Guelph, working as an intern for the Nature Conservancy of Canada (NCC) in NB, and then landing a full-time position with NCC in Ontario, seeing one of my close friends married, and welcoming another little niece. 2016 looks like it’s shaping up to be another interesting adventure, with trips to South Carolina and potentially Alberta, my first ever excursion to Algonquin Provincial Park (!!! ), summer weekends by Lake Huron, and many bird and nature excursions in between. New Year’s resolution: Post more blogs! At the end of 2015, NCC issued a challenge to look back at our year in nature. To help us out, they provided some questions to answer. What species did you learn about for the first time this year? Piping Plover. I got to learn about these birds from their conservation champions out east and even see about two dozen Piping Plover in the wild. 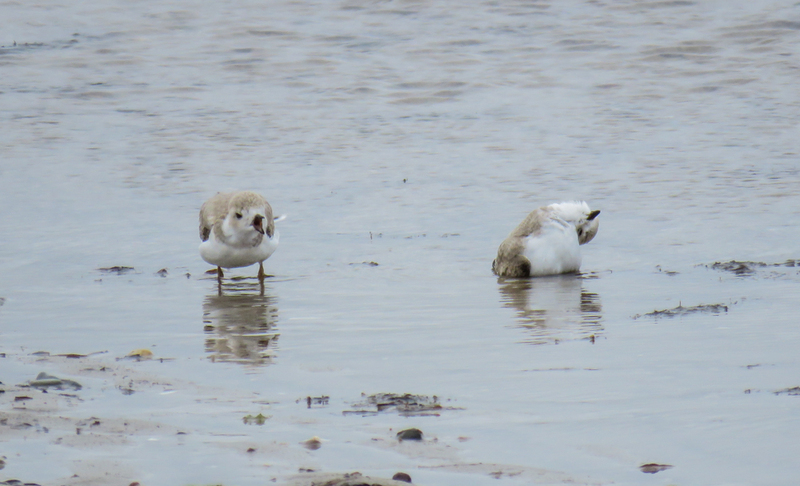 The best sighting was a family of plovers in northern NB, where the parent plovers successfully fledged four chicks. What is your most memorable close encounter with nature from 2015? Finding a butterfly hotspot in Tabusintac, NB. This one patch of clover had about 50 individual butterflies from 6 species. I was in heaven! What fact did you learn about the natural world in 2015 that most surprised you? Moose are endangered in NS, even with a healthy population in neighbouring NB. Three things did you do that helped the natural world in the last year? 1. Interned with NCC. 2. Taught some Girl Scouts and some Cub Scouts about birding and ornithology. 3. Volunteered with the Ottawa Field-Naturalists’ Club. What natural areas did you explore for the first time? All of NB and PEI! What species did you learn to identify, by sight or sound? Bird: Olive-sided Flycatcher, Butterfly: Salt Marsh Copper, Plant: Dragon’s Mouth Orchid. Moved to Fredericton for May through August. Fell in love with Odell park and all of its wildlife (Blackburnian Warbler). Developed a talk on birding and ornithology for children. Presented the talk to a Girl Scout troop and a Cub Scout troop. Visited tidal pools in PEI and had my first encounters with ocean life (like this Moon Snail). Worked as a summer intern for the Nature Conservancy of Canada in New Brunswick. One of my best University Friends got married! Visited my father in South Carolina during spring migration (Carolina Wren). Contributed records of 35 butterfly species to the Maritimes Butterfly Atlas (Red Admiral). Participated in the Carleton bird walks. Continued working on my thesis, both in Ottawa and away from Ottawa. Moved to Kitchener for November and December. Continued to bird (Black-capped Chickadee). But there is always time for the outdoors. Happy Plover Appreciation Day from some bathing Piping Plover chicks! 2015 was the summer of butterflies. As part of my internship in New Brunswick, I kept track of the butterflies I came across while out in the field. On fair-weathered weekends, I spent my time searching for more in parks and at gardens. I was lucky to be able to photograph (with varying quality) each species of butterfly that I found, so that they could be submitted to the Maritimes Butterfly Atlas. I only missed a few species that I hoped to see out east, but I learned a tonne this summer and I look forward to next year’s search.